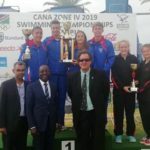 AT the end of four grueling days of swimming the Namibian team participating CANA Zone IV Championships in and around Windhoek had to bend the knee to the team from South Africa. 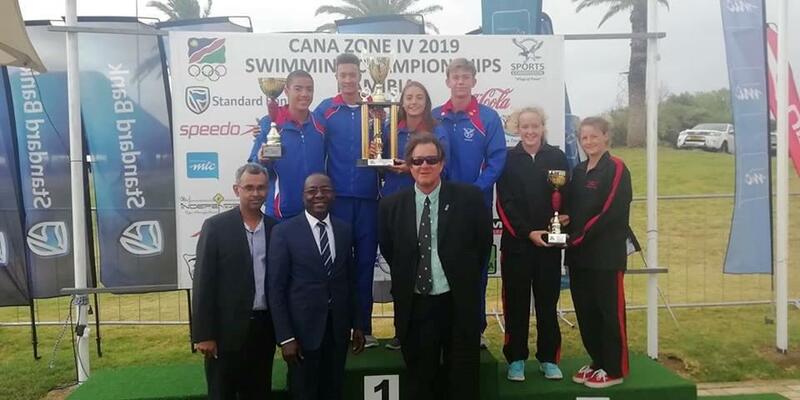 The South African swimming team concluded the CANA Zone IV Championships with an outstanding total of 102 medals across the three disciplines and claimed the top spot on the medal table. They were followed closely by the hosts, Namibia with 90 medals, Mauritius with 47 medals and Zimbabwe with 39 medals. KZN’s Kelly-Ann Brown (14) concluded the competition with two gold medals and one silver, clocking a new Championship Record in the 100m freestyle in 1:01.42, touching the wall in 2:36.16 to claim the 200m butterfly title and finishing second in the 200m individual medley in 2:35.28. Team-mate Lize Coetzee won the silver in the freestyle race in 1:01.80, while Emma Kuhn was over the moon with her Championship Record win in the medley race, touching the wall in 2:30.46 to the 2015 mark of 2:34.16. Cameron Casali bagged another gold medal, this time in the 200m individual medley with a new Championship Record time of 2:15.77, while Kelsea Munro (16) also booked a new Championship Record time of 59.82 in the 100m freestyle ahead of Zimbabwe’s Paige van der Westhuizen (15) in 1:01.21 and Zambia’s Mia Phiri (15) in 1:03.05. In the 200m individual medley, Kian Keylock (13) walked away with the gold medal in 2:20.47, while Megan Shepherd bagged a silver medal in the 15-16 200m individual medley in 2:25.51 and Felix Maseko (16) won his first medal, a bronze, in the 100m freestyle in 55.51. 14 year old Leshen Pillay bagged a silver medal in the 100m freestyle in 57.69 and a bronze in the 200m butterfly in 2:23.78, while Jivall Bodlall (16) also won a bronze in his respective age group 200m butterfly event in 2:19.78. The swimming programme concluded with two gold medals and one silver medal for the South African 200m freestyle relay teams, a new Championship Record for the U14 girls’ team in 1:55.27, gold for the ladies’ Over 15s in 1:53.78 and silver for the boy’s U14s in 1:52.30. The South African U16 Water Polo men’s team won the Championship title after they came out victorious against Zimbabwe’s U18 team by 12 goals to 5, while the ladies’ U16 team narrowly lost out on the gold after losing their match 12-11 to Zimbabwe’s U18 team. The South African U15 men’s development team won all four of their matches during the three day tournament, beating Zimbabwe’s U15 team in their final game today by 12 goals to 3 and claiming the gold medal in the process. The South African U15 ladies’ development team also topped their log with a final win against Zimbabwe’s U15 by 9 goals to 1.